Corcoran Heating and Air ConditioningBlog PostsBlogTechnical Corner: Why De-Humidify? Many clients ask this question during the oft en rainy late spring and early summer. They want to know not only if they should be running de-humidifiers, but what are the risks if they do not and which systems and settings are the best. Good questions, so why not delve into the matter right now so that everyone can benefit from our suggestions? Fact is: our area is wet. Most home-owners who have basements and crawlspaces have either experienced flooding, know some-one who has, or are worried about it. No, this article is not about flooding but mentioning it is an important reminder of how much water our homes and other buildings are up against. Where there is water, heat, and stagnant air – there is higher humidity. Structures with sump pumps, floor drains, flooding potential and hosts of other water sources such as washing machines and lower level bathrooms face high humidity levels and the potential of related issues. Our recommendations: The easiest solution is to run a small portable plug in model in an area of multiple mechanical or water sources. Based on the model, you can set the desired humidity point and fan speed. may be a little greedy, but I have a lot of ground water, and am happy with the results thus far). If the unit can be put in an area near a ground drain – all the better as most come with (garden) hose adaption options which can be run to it along the floor. If not, other units are available with water capture containers which stop the de-humidifier from running when the water reaches a certain level and will restart aft er being emptied. When shopping for one of these portables, know your basement’s square footage and look for a unit with adequate coverage. Also look for one which not only handles the basement square footage, but performs with low electrical usage. For more extreme humidity issues there are whole house de-humidifier options. The same companies that bring you humidifiers will most likely have a full line of ductable de-humidifiers. 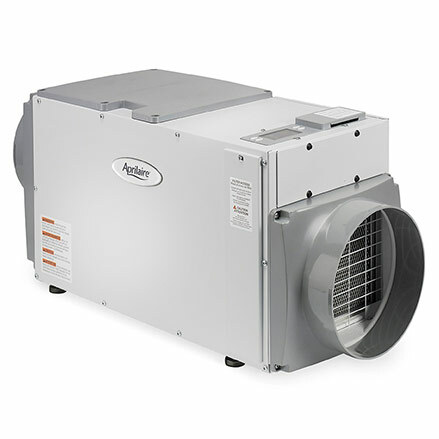 These units interlock with your current air handling equipment and are ducted to condition specific areas of concern. We can get into more details on these if your situation requires. O.K. How long should we run de-humidifiers and what if we don’t? The answers are easy: all rainy season, and all summer long. If not, that musty odor caused by high humidity hangs around, as does an ideal environment for mold to grow. It’s frightening to know that it only takes as little as forty-eight hours, some water, and a food source to cultivate breeding ground for a great crop of this not only pesky and odorous, but potentially health risky crop of troublesome mold. If you have other questions we haven’t covered or concerns about your specific situation, feel free to give us a call. Or – ask our technician when he is out doing your annual maintenance. Also make sure to Google your de-humidifier model number along with the word “recall” to ensure your model has not been recalled. There are a large number of portable units that have been recalled due to potential fire risks.